From our experience, some types of garage door problems tend to occur more frequently than others. This type of system is under a great deal of stress on a regular basis, so some malfunctions can be inevitable. Recognizing the most common issues will help you see to it that they are addressed in a timely fashion and that no further damage is caused. A squeaking sound that suddenly starts accompanying the opening and closing of your garage door can be the result of insufficient lubrication. There are several parts of the system that can greatly benefit from regular application of grease or some other type of lubricant, as they operate under constant friction, which causes them to wear out more rapidly. Lubrication helps to delay this gradual degradation. Luckily, this is something you can take care of yourself in most cases. In order to stop the aforementioned irritating sound, take a light lithium-based lubricant and apply it to the torsion springs, the hinges and the steel rollers (if you have nylon units and/or extension springs then do not lubricate them). Be sure to operate the door a few times afterward to ensure the lubricant gets into all the right spots. This problem can be the result of several factors. It could be the result of worn rollers, bent tracks or even loose springs. If any of these hardware parts are involved, you'll probably need to have a professional assist you in solving the problem, due to the potential dangers involved in dealing with these components. This type of issue is often the result of misaligned safety sensors. These photoelectric eyes are in charge of detecting obstacles and preventing the door from closing on them. They are located at the bottom sides of the opening to your garage and must be perfectly aligned with each other. If they get out of position, they can mistakenly "detect" an obstacle, which will send the door reversing each time you try to close it. Of course, there could also be other reasons for this malfunction, such a problem with the opener's circuit board, or even some fraying of the lift cables or blockage of the tracks that prevents the rollers from getting past a certain point. Again, letting a professional take a look is highly advised. This is perhaps the most common problem of all. Seeing as these components are responsible for supporting the door's weight and helping it move by providing a counterbalance to the panels, they are under constant strain. Eventually, they will break, so replacing them in due time is important. However, people don't often remember to check the condition of their garage door springs, which results in an unexpected breakdown. It will be unmistakable, as you'll hear a loud BANG when such a component breaks, and you wouldn't be able to use your door properly. Spring replacement is a very dangerous task, so professional assistance is an absolute must. 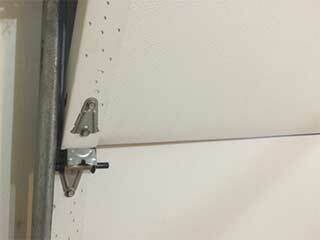 If your garage door opener starts making a strange grinding noise, the main motor gear may have broken. If that's the case, then your door will probably be inoperable, at least not automatically. Give our team at Garage Door Repair Forest Park and we'll replace the damaged gear for you safely and quickly.